J. W. Mann in Artemisia Gentileschi e il suo tempo, catalogue of the exhibition ed. by F. Baldassari-J. Mann-N. Spinosa, Milano 2017, pp. 208 -209. Roma, Palazzo Braschi, Artemisia Gentileschi e il suo tempo, 30 November 2016-7 May 2017, n. 61. The present painting has been attributed to Artemisia by Judith Mann, European Art Curator at the Saint Louis Art Museum in Missouri, during Robilant+Voena’s exhibition in 2011, and is a very important addition to the few portraits known in the oeuvre of this 17th century artist. Artemisia is mainly known for her powerful depictions of Old Testament heroines, but contemporary sources testify to how she was celebrated for her portraits as well. As Judith Mann has emphasised, it is recent critical studies, with its heavily feminist leanings, which has limited the appreciation of Artemisia as a portraitist, but works such as our portrait, as well as the Portrait of the Gonfaloniere (Bologna, Collezioni Comunali d’Arte, fig. 1) or the Portrait of a lady with fan (Genova, Raccolte d’arte del Sovrano Ordine Militare di Malta) attest to the high level of Artemisia’s portraiture. New important findings were brought to light by the 2011 exhibition in Milan. On that occasion the painting was studied anew by Roberto Contini, who was was able to confidently identify the sitter. He found a volume published in 1628 – Les fortifications du Chevalier Antoine de Ville Tolosain, avec l’attaque de la defence des places – where in the frontispiece there is an inscription by Jerome David on the portrait of Antoine De Ville, military architect and Knight of the Order of Saints Maurice and Lazarus (fig.3). Just beneath the etching there are two inscriptions: Artemisia G.P. on the left, and Hieron Dauid F. on the right. These two inscriptions are the proof that David’s portrait is inspired by our one of Artemisia. The high level of sartorial adornment is in keeping with the demeanor of Artemisia’s subject. He holds his proper left hand at the hilt of his sword, extending his index finger, thereby connoting an individual of stature and confidence. His proper right arm juts aggressively and assuredly out from his hip, a pose of male aggression that was first identified and discussed by Joaneath Spicer in her 1991 essay, “The Renaissance Elbow”. In fact, his proper right hand is turned completely in towards his body and recalls a passage in John Bulwer’s Chironomia, his 1644 manual on using gesture in public speaking. The author disparages this very gesture: “to set the arms agambo or aprank, and to rest the turned-in back of the hand upon the side is an action of pride and ostentation, unbeseeming the hand of an orator”. It seems, therefore, that this pose would have been understood by contemporaries as one of arrogance and pride. Beyond mere elements of style, the approach to male portraiture suggests the mind of Artemisia Gentileschi. When she painted the Gonfaloniere in 1622, she responded to the overwhelmingly macho bearing that had become typical of male portraiture from the time of Titian. Artemisia replaced the authoritative right hand that typically rested on canes, pointed to armorial elements, or grasped objects of ownership or rule with one tentatively poised on the corner of the nearby table, obviously eschewing any suggestion of aggression or command. In the current picture, she has gone in the other direction by including an overly assertive gesture and a more secure open stance, most likely in an attempt to provide insight into the character of her subject. One often senses in the work of Artemisia a decision to either deny established protocols or to create ones of her own. One particularly “Artemisian” detail is the use of her initials in the silver trinkets worn around the sitter’s neck. While she was not the only artist to use signatures as a gloss on narratives or as enhancements for subjects, Artemisia was certainly among the most creative picture signers. She experimented with diverse types and locations for signing her name. Her signatures appeared chiseled in stone, embroidered on upholstery, carved into a tree, signed on discarded paper, inscribed in a book, and worked into a metal shield. It is therefore not at all surprising to see her working her identifying initials into items of adornment worn by the subject. This suggests that she and the sitter were on intimate terms. Antoine de Ville was born in Toulouse in 1596. He came from an aristocratic family from the region of the Dauphine’ who moved to the Languedoc in the 15th century. After completing his studies, he entered the service of Louis XIII as a military engineer. He was renowned for the Montreuil-sur-Mer fortifications in the Pass de Calais and the defensive works in Picardy against the Spanish during the Thirty Years’ War. In the 1620’s he participated in the campaigns against the Huguenots in the south-west of France and in 1624 he participated in the siege of La Rochelle. In 1626 he entered the service of Charles Emanuel I of Savoy who awarded him with the Order of Saints Maurice and Lazarus for his military achievements. He moved to Rome in 1627 where he had the opportunity to deepen his knowledge of fortifications. It was probably during this Roman period that he met Artemisia Gentileschi. In 1630 Antoine de Ville moved to Venice and entered the service of la Serenissima. Between 1630 and 1635 he built the fortifications of Pola and restored those of Mantua and Bergamo. His writing, Les Fortifications in particular, had a pronounced influence on French military architecture for the duration of the 17th century and a lasting influence on Vauban’s, the most famous military architect of the period. As previously stated, Antoine de Ville probably met Artemisia most in Rome in 1627. The artist had been in Rome since 1620 when she had returned from her Florentine sojurn. It was exactly five years after the Portrait of the Gonfaloniere in Bologna, but the affinity between the two paintings are very evident. As both Roberto Contini and Judith Mann underline, the vivid naturalism of the two portraits is a product of a continuous dialogue with Simon Vouet, with whom she maintained lively artistic correspondence during her time in Rome in the 1620s’. Determining the portrait’s precise date is a bit more difficult. Details of the costume certainly place the painting within the period between 1625 and 1640. The close analogy of the costume to Bosse’s 1633 print confirms that window of time. Furthermore, lace became an extraordinarily popular costume adornment during the 1620s, and continued so in the subsequent decades, although exact identification of the lace is difficult. It could be a type of Venetian cut lace, known as reticella. However, the first half of the seventeenth century was a period in which many techniques were emerging, and needle and bobbin laces also became fashionable. Furthermore, the determination of dating and geography through clothing is made more complicated by the fact that many European centers followed identical fashion tastes and some styles lingered on in some locales and were abandoned in others, depending on personal preference and patterns of trade. Stylistically, the picture should be placed in Artemisia’s Neapolitan period, prior to 1640. 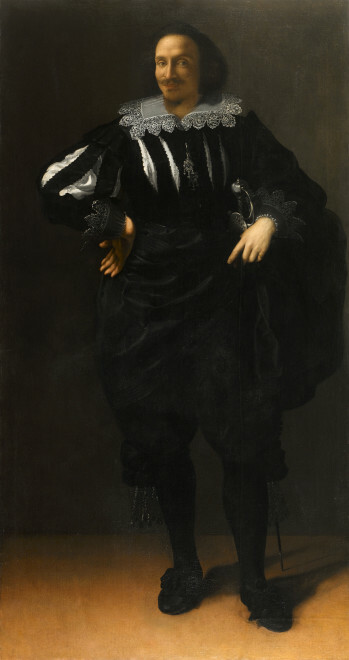 The more refined shading of the face suggests that the picture may have been produced in the 1630s rather than the 1620s. The handling of light and shadow, particularly the more pronounced sfumato, ties the picture to Artemisia’s work in Naples. Furthermore, the physiognomy relates closely to the heads found in some of her paintings of the mid-1630s, namely the Birth of St. John the Baptist and the Corisca and the Satyr.